Although the trip is still a few weeks away, I’ve started to make a few lists and get things organized. The basic essentials for any travel are pretty straightforward, and so making that list isn’t a problem. We have been making a few trips to collect all of the field gear we’ll be using, and we’ve been crossing items off that list slowly and surely. For me, the list I’ve been working on the most is the list of everything else I might need other than the basic travel items and field gear. 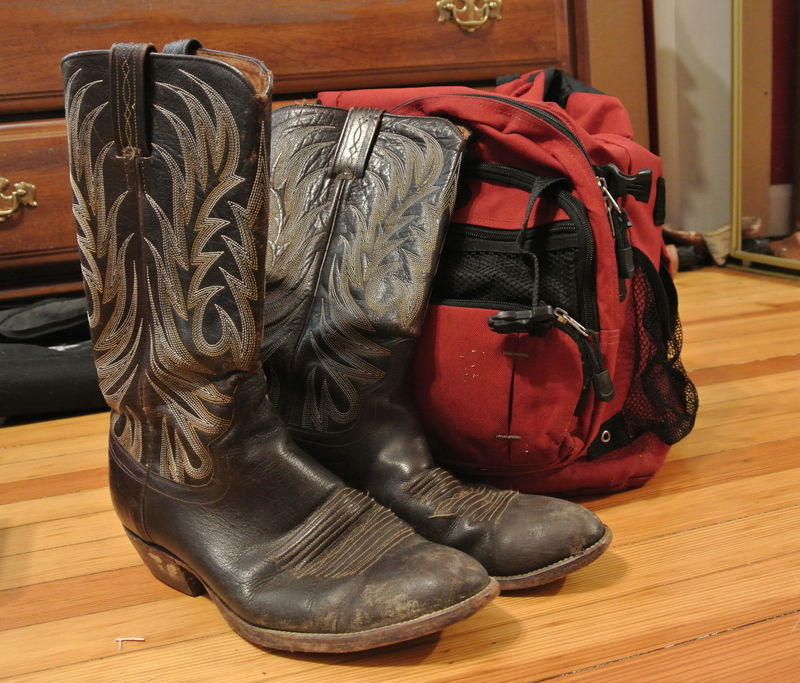 While the list is a difficult one, there is one necessity on the list that I had no difficulty including, and I smile every time I see it on my list: my cowboy boots. I was born and raised in Texas, but it wasn’t until I got down to San Marcos, TX that I realized how important a good set of cowboy boots are. I lived around Dallas, TX for all of my life up until college, and cowboy boots weren’t a huge thing in the city throughout high school. Down in San Marcos I met other Texans from all over the state and learned a lot about Texas culture. I learned to two-step within the first few months, but I had to two-step in my loafers because I didn’t have any boots. A year later while exploring an antique shop in the nearby city of Gruene, I found an old set of cowboy boots that fit perfectly. With holes in the soles and worn-in heels, these boots were far from brand new, and I absolutely loved them for the character. I danced in them at Gruene Hall that night, the oldest dance hall in Texas, and wore them for a few weeks straight afterwards. Here in Indiana, I try and pull them out every now and then. I’m far from being any kind of cowboy, but wearing those boots makes me feel like I’m back at home. Every time an old wooden floor creaks under my boots, I think of Gruene Hall and my old house in San Marcos. Every time I put my boots on, I feel like I’m about to head out to Austin for another Texas night. And so I’m bringing them with me in a few weeks so I can get a little bit of Texas dirt on them again. I won’t be using them in the field of course, but when we fly into San Antonio, I’ll be that guy holding up the security line at the airport as I struggle to get my boots off. I am incredibly thankful to have the opportunity to assist with this human rights crisis in my home state. This work being done in Falfurrias, to me, embodies many of Texas’ most important cultural beliefs. John Steinbeck once wrote: “For all its enormous range of space, climate, and physical appearance, and for all the internal squabbles, contentions, and strivings, Texas has a tight cohesiveness perhaps stronger than any other section of America.” I couldn’t agree more with Steinbeck after participating in the work in Falfurrias last year. Community members are graciously giving anything they can to help people they haven’t met. Law enforcement and search and rescue teams are passionately working every day to find survivors and save as many people as they can. These selfless actions from the community are extremely humbling and inspiring, and while I know that anybody from any state and any country would do the same, I am proud nonetheless to be from a place with such incredible people. And so the most Texan item I own, my pair of cowboy boots, is coming with me. Not only am I bringing my boots as a reminder of where I’m from, but also as a homage to the rich, colorful, and passionate culture of Texas.